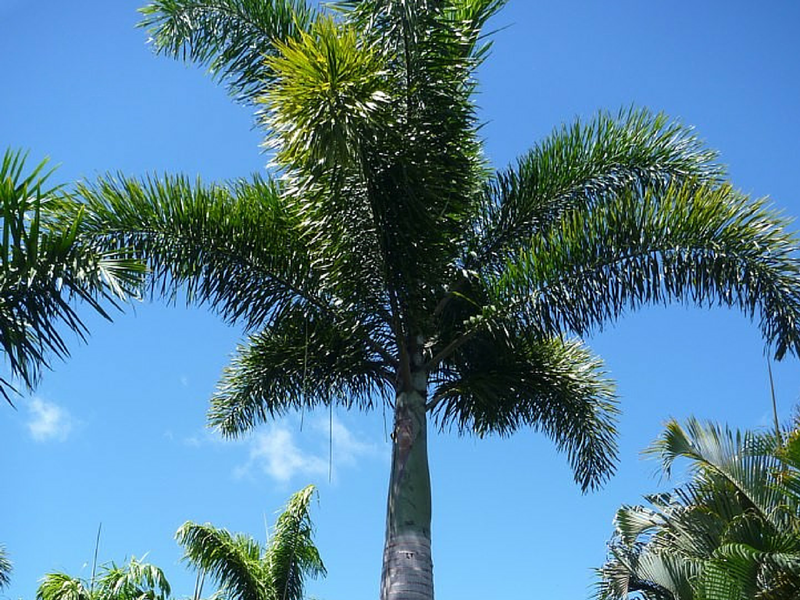 7 Surprising Facts You Never Knew About Palms - Kauai Seascapes Nursery, Inc.
Palm trees: Iconic symbol of a tropical paradise across the world. When most Americans think of Hawaii, the palm tree is undoubtedly one of the things that comes to mind. This association is well-deserved. Whether it’s for shade, decoration, or coconuts, palms are popular across Hawaii and the world. There’s more to this tree, however, than just keeping off the heat, sprucing up a yard, or providing a tasty snack. Palms may be one of the most popular decorative plants today, adorning streets all across the world. The history of people and palms, however, go way back. Archaeologists have found evidence of palms being used for food and household objects in ancient Mesopotamian sites. References to palms are also present in the Christian New Testament, the Hebrew Bible, and the Quran. The date palm is one such example. Even today, the fronds and wood of palms are still used in some places to make houses, baskets, and clothing. Most of the plants we know as palms come from the family Arecaceae (pronounced “ERA-kay-cee-ay”), which contains over 2,500 species. We don’t carry quite that many varieties at the nursery, but odds are we have one that meets your needs. Areca palm: Commonly used for hedges and wind breaks, this easy to grow variety can reach heights of 20-3o feet. Dwarf date palm: Popular for growing indoors (but suitable for outdoor growing as well), this palm gets its name from its small, edible fruits that resemble dates. 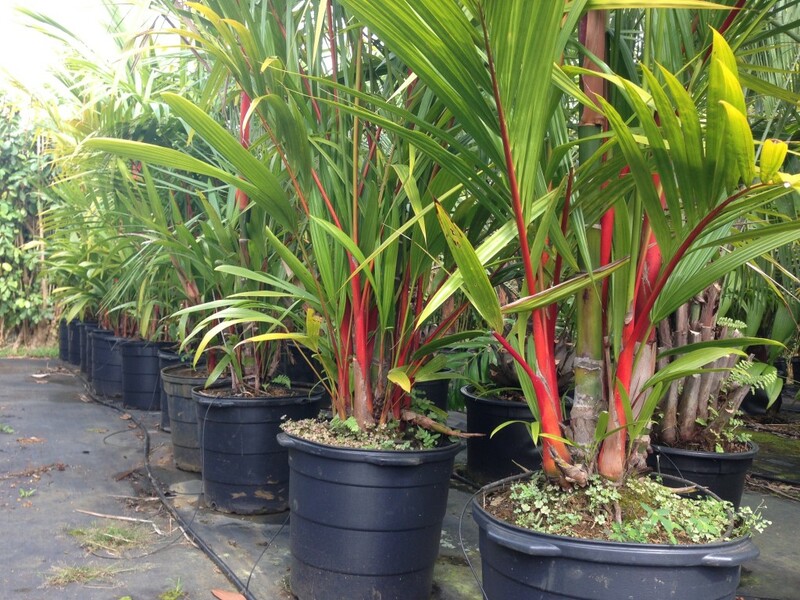 Red sealing wax palm: Our most popular variety here at the nursery, this palm makes a wonderful ornamental addition to any garden. It gets its name from the resemblance of its bright red fronds to the wax used to seal letters. Fun fact: The world’s largest palm variety, the Quindio wax palm, can grow up to 197 feet tall! (sorry to say we don’t carry this one at the moment). When I think of evergreens, I usually imagine something like a pine tree, but it turns out that palms are evergreens as well, never losing their leaves in winter (not that we have to worry about the cold much here in Kauai). I guess palm trees have more in common with Christmas than we might imagine. Dates – Produced by the date palm (Phoenix dactylifera). Not the same as the dwarf date palm (Phoenix roebelenii). The açaí fruit – Product of the açaí palm (Euterpe oleracea), this fruit is very popular right now as a health food. Saw palmetto extract – From the fruit of the saw palmetto (Serenoa repens), this extract is used by some as an alternative treatment for enlarged prostate. Heart of palm – A popular addition to salads, heart of palm is a tasty food. We don’t recommend you try harvesting it from your own palms, however, as it will kill the tree. Palm wine – In some parts of the world, the sap from palms is even made into wine! Check out this video for a look at how it’s done. Palms are a good addition to your garden because of their sturdiness. Unlike other varieties of trees that may blow over in bad weather, palms are very resistant to wind because of their leaf structure, flexible trunks, and sturdy root systems. Their sturdy roots also make them resistant to flooding. So if you plant a palm in your yard, you can rest easy knowing its unlikely to topple over with the first strong wind or storm. Just as the history of people and palms goes back to ancient times, so too does their symbolism. For ancient Egyptians, the palm branch represented immortality. In ancient Roman times, palms symbolized victory. For Christians, the palm symbolizes Jesus’ entry into Jerusalem. Palm fronds are still used as part of the Christian celebration of Palm Sunday. The closed frond of the date palm is used in the Jewish festival of Sukkot. In Islam, the palm branch can be a symbol of peace. Today, palms appear on the flags of Haiti, Guam, Florida, South Carolina, and Saudi Arabia. We now know that palms are the source of many food products, and everyone loves them for their shade and beauty. But it turns out that palms have many other uses as well. Hats – Coconut palm leaves can be used to make durable, water-resistant hats. If you want to try it for yourself, here’s a video showing how to make one. Furniture – Ever heard of rattan furniture? Turns out it’s made from the wood of rattan palms. Scented candles – Palm wax candles offer an alternative to soy or paraffin wax candles. Masks – Palm fronds can be used to weave beautiful masks. Have a look at this Etsy store for an idea of what’s possible. Baskets – Palm fronds provide an excellent material for weaving baskets. Again, if you want to try it for yourself, watch this video. Who knew palms had so many diverse uses? Curious to know more about palms? Want to start growing your own? How to care for palms – This video goes over a few of the basic varieties of palms and how to care for them. 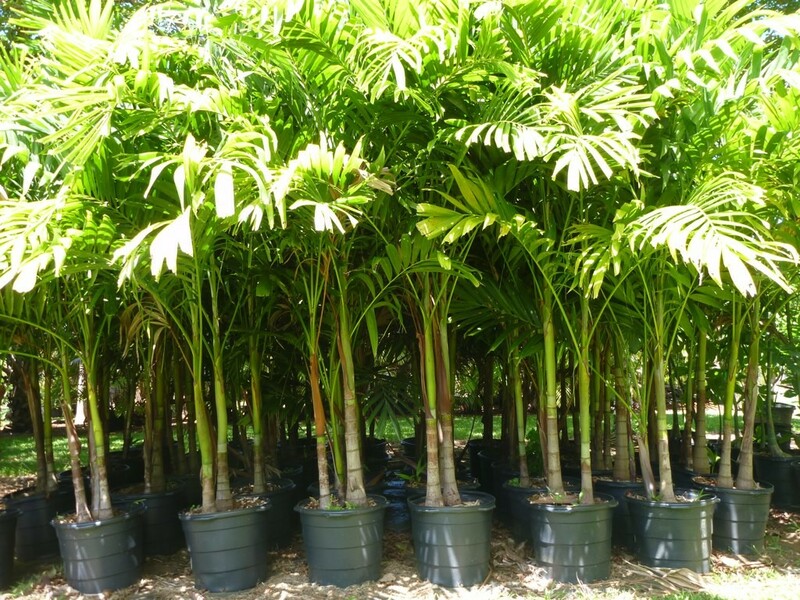 Kauai Seascapes Nursery Palms – This page contains a list of all the palms we currently have for sale at the nursery. Palm Tree Passion – This site contains most everything you’d want to know about palm trees. 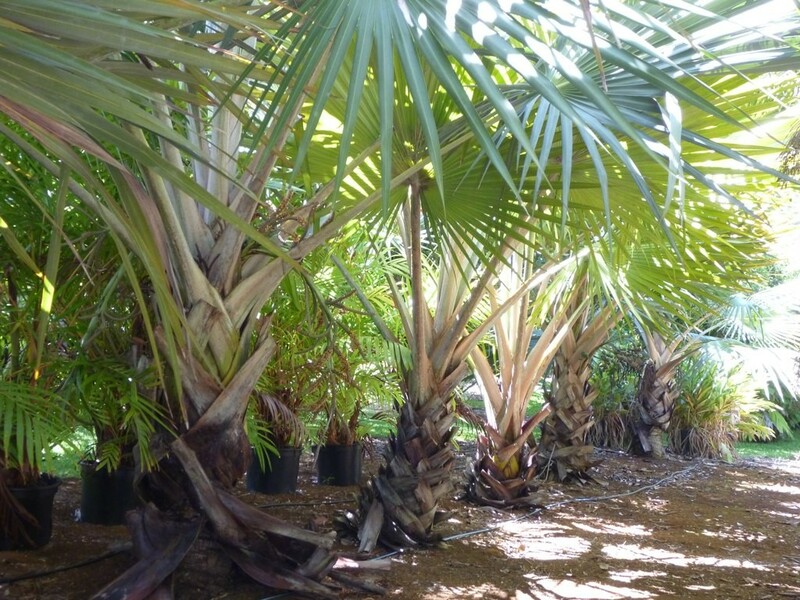 For detailed advice on what palms are right for your yard and garden, stop by the nursery and ask a member of the team. What’s your favorite thing about palm trees? Have a favorite variety? Let us know in the comments. Really great article, love the photos ! Great article. I got accepted into the master gardeners program here, so learning so much about plant care, etc. Now I have about 50 Manila Palm seeds germinated. When is the proper time to plant them? I’ve been a palm collector for 35 years & in the 12 yrs. I’ve lived in P-ville, I now have 8 of the 21 spp of Hawaian endemic Pritchardias; favs are P. viscosa, hardyi, martii, & minor. They have lovely fan shape pleated leaves & many have silvery hairs on the underside that are very attractive. Since Kauai has 8 of the 21 endemic Pritchardias it would be great if you propagated & sold them as their beauty & relatively small size are perfect for home gardens. great article! Love the Loʻulu palms. I propagated some from seed that came from the pritchardia napaliensis and limahuliensis trees out front of admissions at KCC. An 18-24 hour hot water soak was the most effective method of scarification for germination that I used.